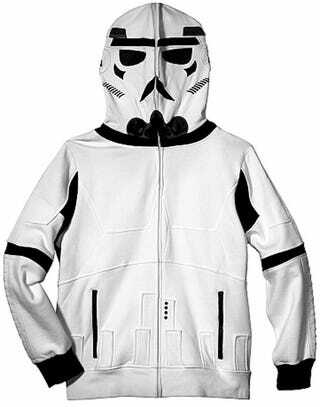 By Mark Ecko, this Stormtrooper hoodie will ensure that, at a moment's notice, you will be ready for an impromptu Star Wars convention or back alley role-playing fest. It may sound like overkill, but to the die-hard Star Wars fan, it's a whole lot easier than carrying around plastic armor everywhere you go. $98 through Ecko's site, there's a pretty great Boba Fett version as well but it's lacking the ever-important, identity-protecting mask. [shopecko via Tcritic] UPDATE: Enter 'STARWARSFAN8' at checkout and get $10 off orders of $100 or more and free shipping. Deal is good through Saturday.